Hello and welcome to exampundit. 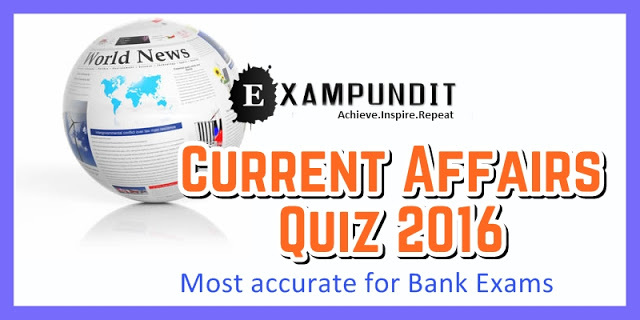 Here is the second set of Financial Current Affairs Questions for the upcoming SBI Clerk & PO Mains Exams. These are based on the Current Affairs from June, 2016 first week. The topics include, news related to finance, industry, MoU, investments, reports related to economy and all the financial awareness. rank in 2016 Global Retail Development Index (GRDI) on easy of doing business? energy initiatives worth how much amount? in news when RBI introduced it. What does S4A stands for? enabled ATM in Bengaluru on June 13. The Bank pilot launched India’s first Aadhar based ATM in ___________. loan did Asian Development Bank recently approve for irrigation system in Tamil Nadu? Kilometres of State roads in Jharkhand?